Designed for testing of a single ECU in either closed- or open-loop mode. 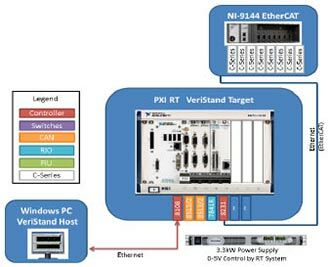 Consists of an NI PXI chassis containing a real-time controller, an NI reconfigurable I/O (RIO) FPGA module, a fault insertion system consisting of a series of high-current switch modules, two CAN communication cards and an Ethernet module to serve as an EtherCAT master. Analog and digital I/O are implemented via NI c-Series modules in an NI EtherCAT expansion chassis. Readily expanded to enable simultaneous, closed-loop testing of multiple ECUs.